The Real Easter Egg, which explains the real meaning of Easter (yes, it mentions Jesus), is on sale in Tesco, Waitrose, Morrisons and dozens of independent retail outlets. But Sainsbury’s refuses to stock it, for some reason. 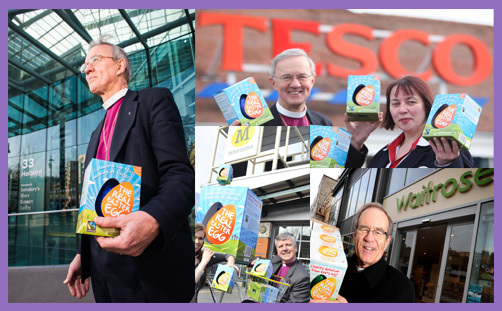 Bishop Anthony Priddis was welcomed at Tesco, Bishop Andrew Watson at Morrisons, and Bishop Nigel McColloch at Waitrose. These stores have no problem with selling an Easter Egg which tells the Easter story (yes, it mentions Jesus). But when a bishop went to Sainsbury’s HQ in London, the doors remained firmly shut. “After six years of trying to get products which cater for the Christian community into Sainsbury’s, we wonder if they have a problem with faith,” said David Marshall, Director of The Meaningful Chocolate Company Ltd.
Because it’s not just Easter when Sainsbury’s seem to have a problem with Jesus: on the run-up to Christmas they stock Advent calendars for dogs (yes, for dogs), but every year they reject The Real Advent Calendar, a Fairtrade charity calendar which includes a copy of the Christmas story in the box (yes, it mentions Jesus). So at Christmas, Sainsbury’s provide dog owners with canine calendars of meaty treats, but they won’t provide Christians with a Christian calendar for their kids which tells the story of Christmas – presumably because it mentions Jesus. According to a 2016 YouGov survey, 80 per cent of the population say they want to see products which mention Easter on the shelves of supermarkets at Easter. Yet every year Sainsbury’s reject The Real Easter Egg, which not only mentions Jesus, it is the UK’s only Fairtrade egg, which means that farmers and growers in developing countries receive a fair price, plus an additional Fairtrade Premium to invest in community projects – giving them more control over their lives. And the Meaningful Chocolate Company gives money to charity – lots of it. But that’s of no consequence to Sainsbury’s, which maintains its Jesus boycott: Easter for them is about Heroes and bunnies and pretty pink bows. Jesus might cause a bit of a stink. And the cross.. well, that’s just offensive. But even in Tesco, Waitrose and Morrisons there are reports of The Real Easter Egg being hidden from view. “Some customers have had to wait while supermarket staff have gone to find it.” Really, what’s the point of stocking a product and then hiding it from customers? Millions of Real Easter Eggs have been sold over the past six years, so the demand is clearly there. So, come on, Sainsbury’s, please explain. If the Sainsbury family can have a charitable trust, the objective of which is “to advance the Christian religion and promote Christian organisations and the charitable purposes and institutions they support”, and “to advance Christian education and learning”, what on earth is wrong with an Easter Egg which tells the real meaning of Easter? Unless, of course, you really do have a problem with the resurrection of Jesus and the good news of salvation.